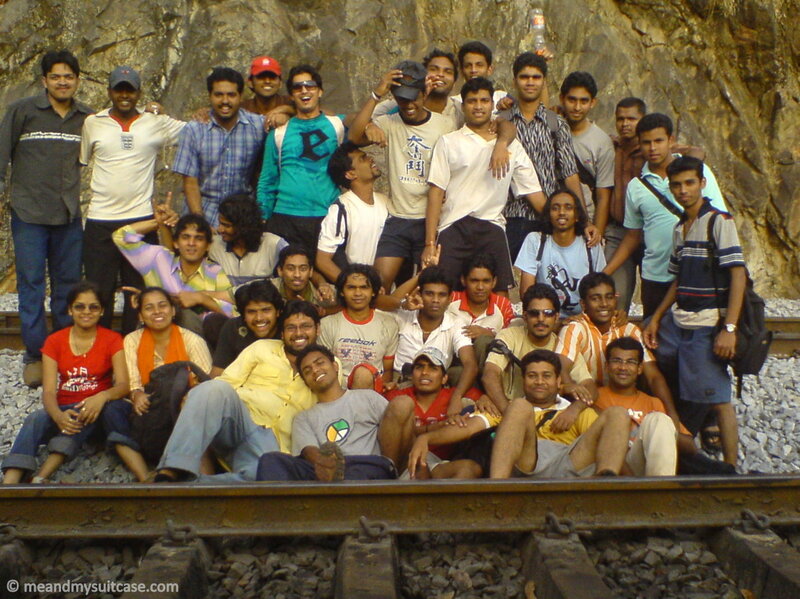 My first independent trek ever, Dudhsagar falls is every ones dream. Dudhsagar literally means Sea of Milk and is a four-tiered waterfall which falls majestically into the lap of mother earth. The area is surrounded by lush green tress and is a forest area. The sound of gushing water and the constant insect noise from the jungle makes for the natural music which pretty much stayed with us throughout the trek. Around 50 students started early morning, one bus and a long road trip. We reached Kullem station where the bus was parked and we started through the mud path towards the base of Dudhsagar Falls which is around 12 km walk. Among friends and acquaintances we kept moving ahead. It was the final semester of the college and a trip like this was a big milestone. Trekking through the muddy and at some places rocky terrain we reached the falls by noon after a very long walk. On the way we did spot small streams and had crossed through forest patches too. We spent some time at the fall base, played with water and had our lunch before trekking uphill to the Dudhsagar falls bridge. It was totally awesome. I was awestruck by the beauty that surrounded me, the sun had a shiny affect on water and everything green looked so soothing. Around 16:00 we started trekking uphill through shrubs and rocks, on our left was the falls while on right I could see only rocks covered with trees; on top, the tracks and when we saw down, it was water in a huge bowl. The rail bridge was not very far but the slope was steep. One by one, we kept climbing giving each other the helping hand. 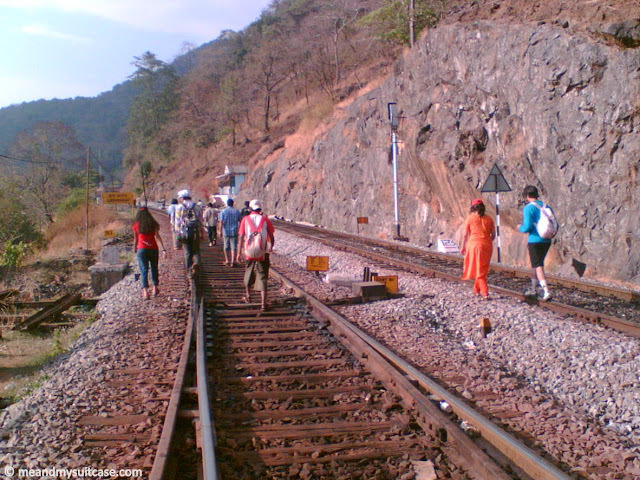 Our target was to catch the train from Dudhsagar Falls station on our way back but we reached on top only to find out that we had missed our train. With no knowledge of next train we had no other option but to keep walking along the tracks through the dense jungle. But before we started, a few shots were mandatory. Sitting on tracks, walking through the tunnels, we stole a few moments which makes for a fond memory today. It was already 18:00. The sun had started to leave our side but the sound of waterfall never did. There was a sense of excitement with a mixed feeling of anticipation about the unknown pathway and a night in jungle. The unpredictability lead to adrenaline. The night seemed unending, it was quiet but uncanny, made us jittery but I must admit, it was something which planned adventure could have never given us. We kept walking till we could finally contact the station master. It was already 20:30 when we heard the good news. A goods train was headed our way which the station master had then arranged for our safe and sound journey back to the base. We hitchhiked the goods train and travelled back to Kullem in the last open to sky coach (Sigh! I don't have a single picture of that night). That was the most beautiful night ever; clear sky, new moon, twinkling stars, the sound of the train in sync with waterfalls and chirping insects, wish the night had never ended. 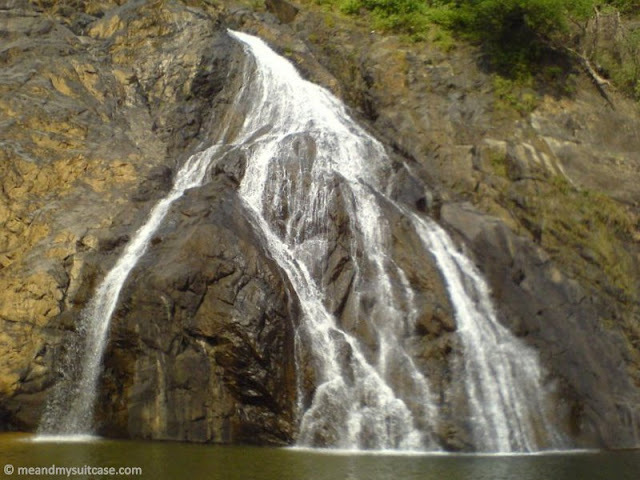 Dudhsagar Falls is located on the Mandovi River bordering Goa and Karnataka. Located in the Bhagwan Mahaveer Sanctuary and Mollem National Park of western ghats, it is also among one of the taller waterfalls with a height of 310 m (1017 feet) and an average width of 30 m (100 feet). I am sure I walked around 25 to 30 km that day. Ain't that Wow! I was humbled by the grandeur of the waterfalls, I was in awe of nature and experience, the unplanned adventure had given us. Motto is "Never ever underestimate time because it keeps changing and change is inevitable. But my faith is whatever happens, happens for "only" good." - A very important mention goes to my friend Sujay without whom I could never complete this article. I remembered in flashes and only the experience but Sujay helped me with the facts of that day. His inputs bridged the gap and helped me weave this story. - Pictures here are not taken by me but are from various batch-mates who were on this trip. So credit goes to all of them as well who helped in making these memories. Hope you liked the story, a trip down my memory lane © 2007. Don't forget to leave your comments below and do subscribe to our website for more travel stories. Have been planning since a long time now. Loved your blog. Saw a glimpse of it in the movie Chennai Express. Thanq buddy. Btw check with officials before you go..It seems after the movie in fact one incident had happened and some trek trails are hence shut down. Your link ain't working. Not able to check. You can tweet to me if you want. Amazing writeup. The images are clicked so well. I really want to explore this thrilling waterfall. �� Keep travelling! Have been planning this since a long time. We might do the Jeep Safari which they offer. Anyways, loved your blog and the way you described it beautifully. Keep it up! Yeah. That should be fun ..Jeep safari through jungle. Great post! 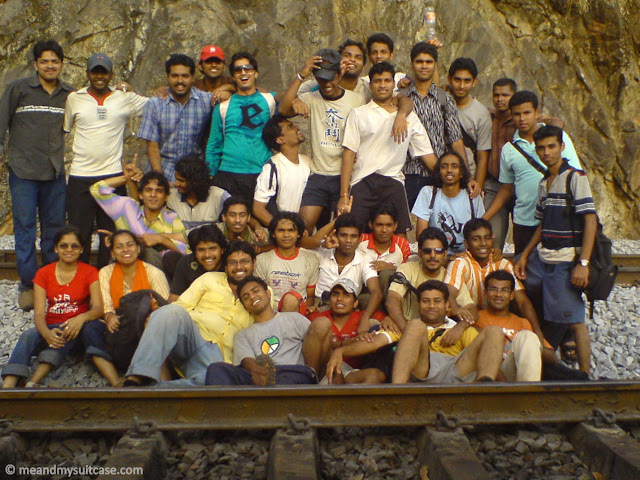 The real beauty of Dudhsagar falls can be experienced only by trekking there. Happy travels! Beautifully narrated!!! This reminded me of my first trek with my daughter :) I witnessed Dudhsagar falls from train sometime back. Craving to take this trek to Dudhsagar now. Keep writing! wonderful! added in my list! I never planned treking to Dudhsagar but I have always wanted to cross the falls on a train and click the classy waterfall-wth-train picture from the base. Last year I took the Chennai Express and thought we would cross the falls, but turns out the movie makers just re-routed it for the movie- actually it doesn't come in the Mumbai-Chennai direct train route. Lol. Have been planning since a long time now. Loved your blog. Is the trek easy or moderate to do? If I will go to MH will surely give a try. Trek is easy to moderate. Please check before you go, some trails are shut down as I have heard. Finally Visited last week to this wonderful place! cool experience, even though climate was hot. Glad to hear that Bob. Did you go for trek? Has it opened to public again?